One of the most popular plant that home gardeners want to have in their garden are tomatoes. Salad tomatoes is a very popular home garden crop because its not only good and mix great with salad but the healthy benefit it gives. But many gardeners often encounter problems with their crops and with tomatoes, many times, most of it does not ripe. With seasoned gardeners, they have ideas and tricks how to ripen green tomatoes even not in its proper temprature a normal tomato grows. And home gardeners think that they can’t ripen their tomatoes like the expert gardeners. That’s what they thought. Remove dead leaves in your crop. With the right amount of compost tea or fish emulsion, you are giving a dose of food nutrient and energy to your crop even if its out of season. If the temperature drops to 70 degree and lower, you can speed up the ripening by pinching off new flowers. In light frost, you cancover your plants with a sheet. and leave it during the day. If there are still green tomatoes left, you can put your plant, if its in a container to a dry place. If its in a plant bed, you can just pull it off and transfer it in a drier place. The fruits will continue to ripen and will still have some of the benefits of ripening on the vine. 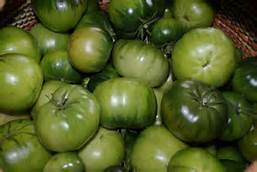 Other gardeners use the old ripening trick of picking the mature green tomatoes and continue to ripen it in a dry place like inside the house or garage. For indoor ripening of your tomatoes, place them in an area where they can recieve enough sunlight but not too much. Some gardeners wrap the tomatoes with newspapers and put them in a box in a dry spot. Usually, with this trick, it will take 3-4 weeks for the tomatoes to ripen.